Archived article by Dominic Selwood. Debunking Christianity: Do Ossuaries Claimed for St James and St Peter Prove a Historical Jesus? Jerusalem Forgery Conference, Special Report. Archaeometric overview of the Jehoash Inscription and James Ossuary. NO SHE-DEMON has ever achieved as fantastic a career as Lilith, who started out from the lowliest of origins, was a failure as Adam’s intended wife, became the paramour of lascivious spirits, rose to be the bride of Samael the demon King, ruled as the Queen of Zemargad and Sheba, and finally ended up as the consort of God himself. 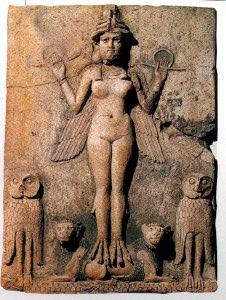 The main features of Lilith’s mythical biography first appear in Sumerian culture about the middle of the 3rd millennium B.C. What she meant for the Biblical Hebrews can only be surmised, but by the Talmudic period (second to fifth centuries A.D.) she was a fully developed evil she-demon, and during the Kabbalistic age (thirteenth to sixteenth centuries) she rose to the high position of queenly consort at God’s side. Evidently, this is no longer a lowly she-demon, but a goddess who tames wild beasts and, as shown by the owls on the reliefs, rules by night. These lines are part of an incantation text used to help women in childbirth- one of many extant from the period of the Assyrian Empire and the new Babylonian Kingdom-and they show that by that time the myth of Lilith had all the major features which were elaborated to their fill two thousand years later by Kabbalistic Judaism. The Mesopotamian and North Syrian material surveyed above supplies the background to this prophetic allusion. Evidently, Lilith was a well known she-demon in Israel of the eighth century B.C., whose name only had to be mentioned to conjure up the beliefs current about her. That she is said to find a place of rest in the desert seems to tie in with the episode recorded in the Sumerian Gilgamesh fragment- after Lilith the desert,she evidently found repose there.